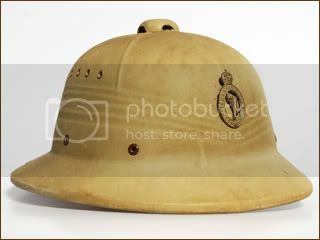 The classic South African sun helmet, these were meant to replace the British Wolseley pattern helmet. 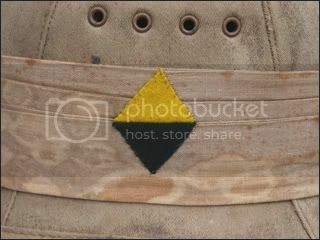 This example is features the early pattern ventilation at the top, and has the flash of the First South African Division (yellow and green diamond). 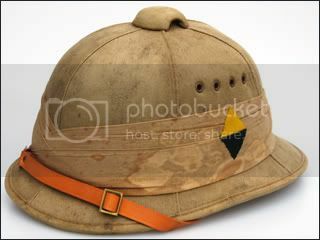 It is dated 1943 and stamped "SAPHI" for "South African Pith Helmet Industries" as well as being stamped with the "U" and arrow as well as the city of "Pretoria." 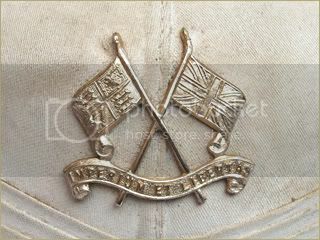 This example is features the early pattern ventilation at the top, and has the badge of the Imperial Light Horse Regiment, which was first raised for service during the Second Anglo-Boer War in 1899. The unit today serves as an Armoured Car Reconnaissance Regiment. 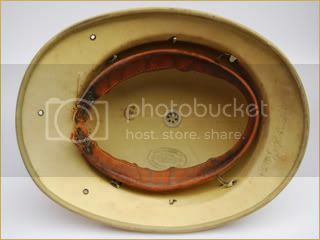 This helmet likely dates to the early post-World War II era, suggesting there was overlap with this pattern and the ventless pattern. 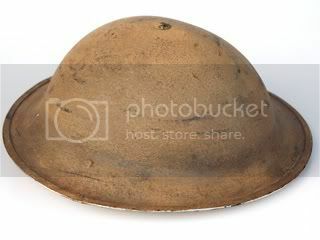 Used during the 1930s and 1940s these were reportedly designed as polo helmets, but were used by the South African army in place of the steel helmet. 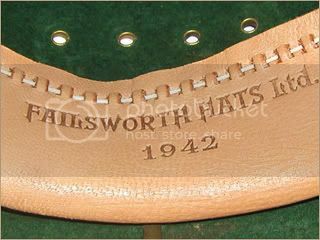 This example is dated 1942, and was made by Failsworth Hats Inc. 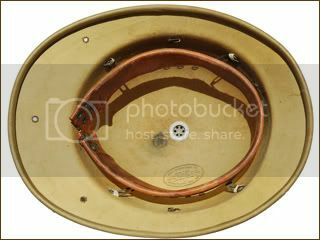 It appears that only the British made versions lacked the top ventilation. 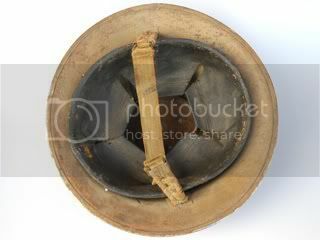 This variation of the Canadian Hawley pressed fiber helmet is unique in that it has a real top ventilator and three holes in the back of brim for attaching a neck screen. 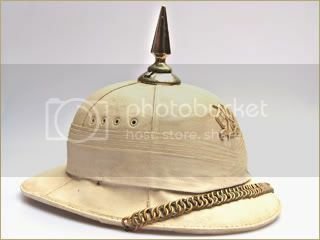 This version was designed as an export helmet for South Africa, as it was based on the South African "polo" style sun helmet. 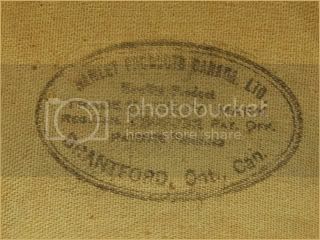 A later pattern based on South African "polo" helmet, made by the Canadian Hawley company. 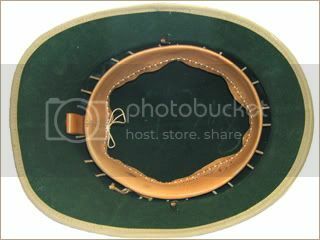 This pattern is based on the early South African helmets, but is made of pressed fiber. 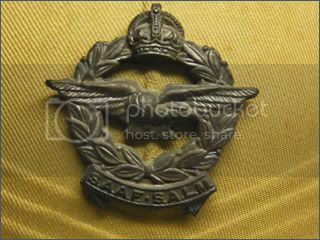 This example features a World War II era badge to the South African Royal Corp of Signals, with the King's Crown. 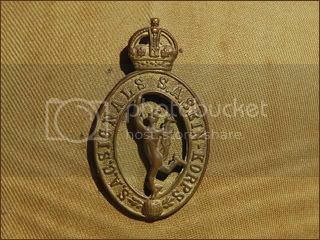 The Royal Signals cap badge is heraldically described as; "The figure of Mercury holding a Caduceus in the left hand, the right hand aloft poised with the left foot on a globe all silver above the globe a scroll inscribed 'Certa Cito' and below on each side six laurel leaves all gold, the whole ensigned with the Crown in gold." But to every member of the Corps it is affectionately know as "JIMMY". 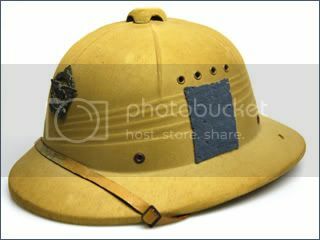 A later pattern based on South African "polo" helmet, which features a World War II era badge to the South African Royal Air Corp as well as the blue flash sewn to the sides. 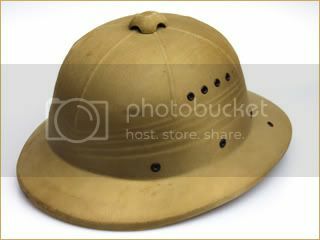 The British MkII steel helmet was used by the South African military during World War II, typically painted tan for the use in the North African desert. 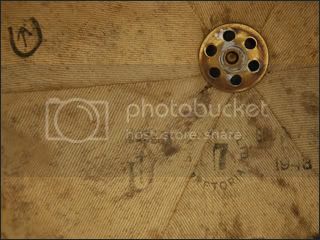 These rae noted by the addition of three holes for the neck curtain. 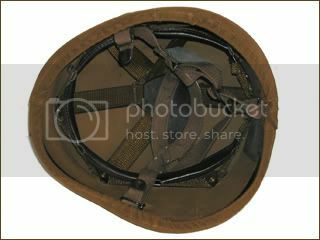 Introduced in the 1980s to replace the Israeli M76, these helmets were produced by S.A.P.H.I. 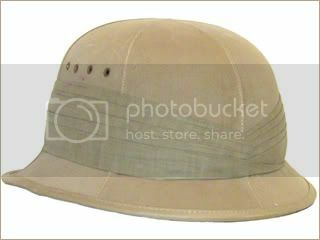 Ltd. (South African Pith Helmet Industry Ltd.). 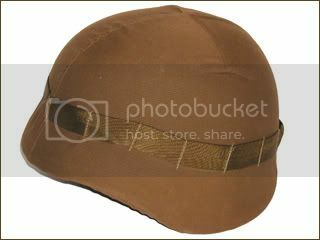 This example features the flat brown camo cover.